The Beach House Resort, on the island of Gili Trawangan is an innovative and contemporary resort set amidst tropical gardens, facing the sparkling turquoise waters of lombok strait. The resort accommodation comprises a 4-bedrooms private villa with fresh water pool, 2 Pool Suites sharing a freshwater plunge pool and 12 bungalows set in tropical gardens. 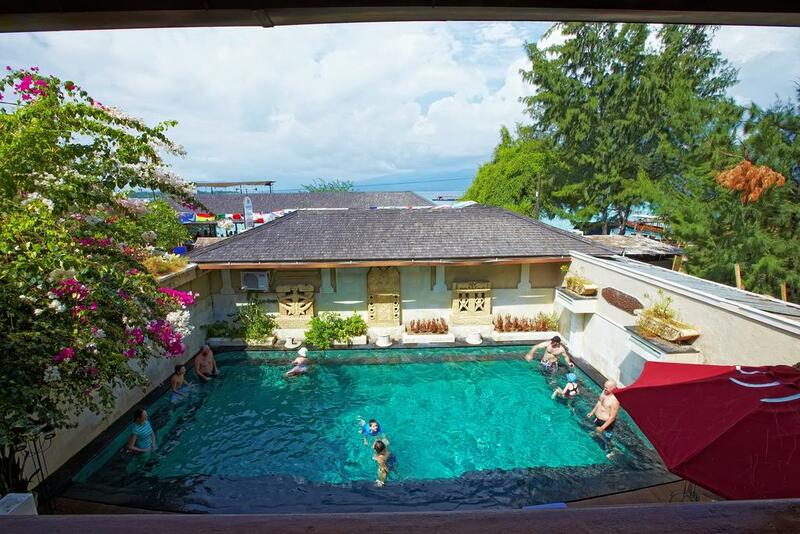 Additionally, The Beach House provides a range of facilities, including a beachfront freshwater resort pool and bar and a waterfront bar and restaurant serving International cuisine. The two-storey Villa overlooks the beach and has 4 double bedrooms each with private en-suites and freshwater showers, A/C, DVD/CD player, in-room safes and satellite television. The Villa has intercom connection to the restaurant, a fully stocked fridge/freezer, glasses, crockery, cutlery and cookware. A chef can be organized to cook you gourmet meals upon request. The upstairs dining and sitting area is fan-cooled and features a large deck with views across the water to Lombok. The downstairs living area is fan-cooled and has a DVD/CD/cassette player, Flat Screen Satellite TV and casual dining that opens onto a wooden deck with sun lounges and a 10m freshwater swimming pool with adjoining shower and guest WC. 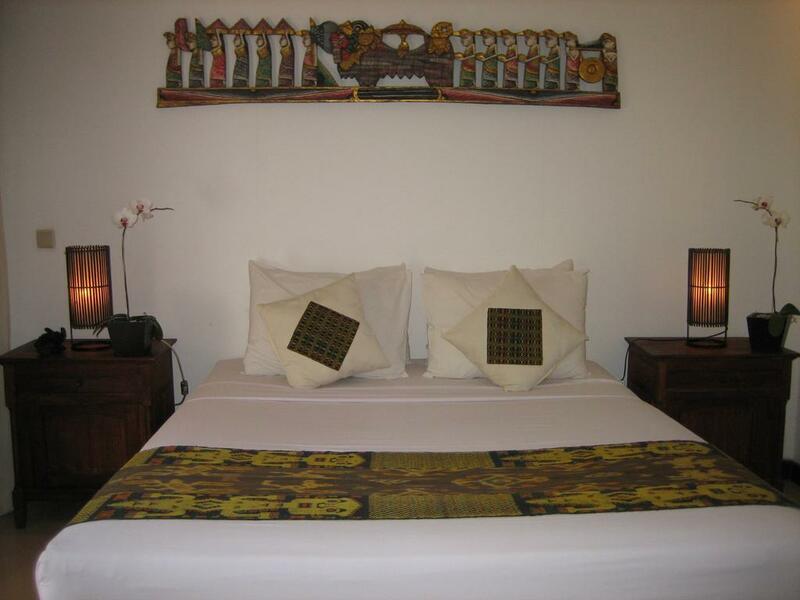 Villas Jepun and Melati are secluded behind courtyard walls and accessed through beautiful tropical gardens towards the rear of The Beach House Resort. 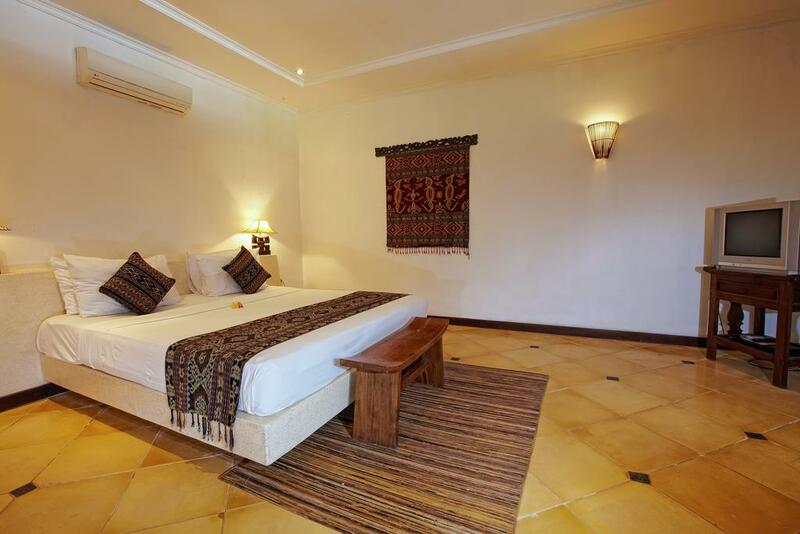 Each Villa has 2 double bedrooms with private ensuites, semi open-air hot & cold freshwater showers, A/C, DVD/CD players, Satellite televisions and in-room safes. The kitchens have a fully stocked fridge/freezers, glasses, crockery and cutlery. Intercom room service is available. The open air living and dining areas are fan-cooled with additional DVD/CD players and Satellite televisions. The living areas open onto wooden decking with sun lounges and 5 x 2 1/2m private freshwater pools. A spacious 1 bedroom deluxe bungalow with adjoining twin bedroom, with shared bathroom and semi open-air hot & cold freshwater shower. A/C, DVD/CD players, satellite televisions, refrigerator and in-room safe. The open design makes this accommodation suitable for families and has wheelchair access. The Pool Bungalow features sundecking and a shared freshwater plunge pool. A spacious 1 bedroom deluxe bungalow with separate bathroom and semi open-air hot & cold freshwater shower. A/C, DVD/CD player, satellite television, refrigerator and in-room safe. The Pool Bungalow features sundecking and a shared freshwater plunge pool. All Deluxe Double and Twin Bungalows have semi open-air bathrooms with hot/cold showers, fresh rinsing water, A/C, refrigerator, DVD/CD players and Satellite televisions, in-room safes and outdoor terraces looking onto tropical gardens. One bedroom standard bungalows with private bathrooms with hot/cold water, fresh rinsing water, A/C, DVD/CD players and Satellite televisions, in-room safes and outdoor terraces looking onto tropical gardens. One double or twin bedroom studios with private bathrooms with hot/cold water, fresh rinsing water, A/C, DVD/CD players and Satellite televisions and in-room safes. The Beach House Resort Tree Houses are traditional Indonesian huts on stilts situated in their own private garden. Each Tree House has a double bed with mosquito net, in-room safe, cooling fan, and fresh hot and cold water.